Since I posted my mom’s recipe for Za Jiang Mein (a Chinese staple I could not live without), I’ve promised to post my mom’s vegetarian version. I know it took forever (four months), but all good things come to those that wait, right? Well, this is a good thing, a very good thing. Plus, you will not get this anywhere else. Though every Chinese family has a recipe for Za Jiang Mein (always made with pork), this Vegetarian Za Jiang Mein is my mom’s own recipe that she developed herself. I guess the apple doesn’t fall from the tree. She’s often creating new dishes or figuring out a restaurant dish. She doesn’t write her own blog though, so this is the only place you’ll get a Kelly Lee recipe. Most American kids cannot imagine growing up without Spaghetti and Meat Sauce or Bolognese. 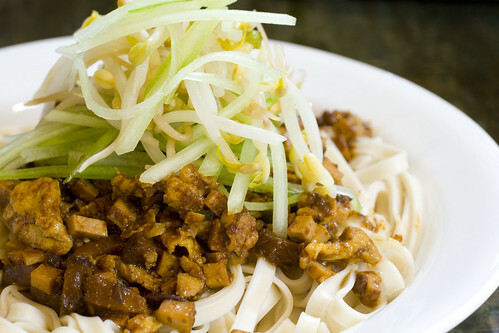 For Chinese kids, it’s Za Jian Mein, Noodles with Pork Bean Sauce. It’s sweet and salty, with a chunky thick sauce that coats noodles so well, irresistible for kids, and a heaven sent for mom’s because it’s just too easy to make. It’s no wonder we ate this a gazillion times. 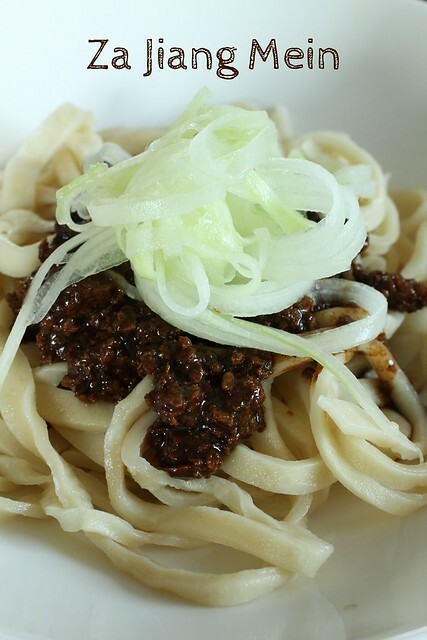 We’d ask and before you know it, a piping hot bowl of noodles would be on the table.